US-based crane and access rental company ALL Erection & Crane Rental has ordered 15 units of Tadano’s 50 tonne GR-550XL Rough Terrain cranes as well as two 400 tonne ATF400G-6 All Terrain cranes. The two 400G-6s, which will be based at the company’s Chicago and ALL Canada branches, feature a five section 60 metre main boom and a 76 metre luffing jib, offering a maximum under hook height of 122 metres. It is capable of lifting 360 tonnes at a three metre radius and taking 54.6 tonnes to 20 metres. The GR-550XLs feature a 34.7 metre main boom with an 8.8 to 15.2 metre bi-fold swingaway extension with offsets of five, 25 and 45 degrees. 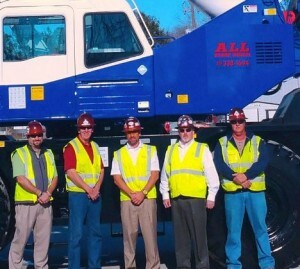 ALL Erection & Cranes Rental is one of largest crane and equipment rental and sales companies in North America. Operating from 37 branches the company provides a range of cranes, aerial work platforms, telehandlers as well as other lift equipment.